The day featured instruction from Webster professors and original compositions from current Webster students. Webster University's Department of Music welcomed 20 St. Louis area high school students to campus Dec. 2 for its inaugural Composition Workshop. 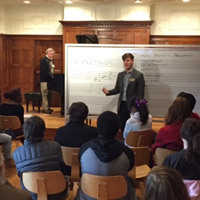 The event featured professors Kim Portnoy and David Werfelmann discussing techniques for writing original music, careers in composition, and how to be prepare for college entrance auditions. In addition, current composition student Zach Fendelman led the participants in an exercise to compose music for a video game sequence. The day ended with a performance of the New Music Ensemble, featuring original music by students from the Department of Music in Webster's Leigh Gerdine College of Fine Arts.